I recently received a very interesting question from an AppGini user regarding implementing full-text searches in AppGini apps. The user had a table containing millions of records, and normal search operations on a text field took too long (about 1.5 minutes according to the user). When he tried adding a full-text index on that field, and using full-text search, search time dropped dramatically to several milliseconds. Unfortunately, AppGini doesn’t yet support full-text searches. So, in this post, we’ll try to address that using hooks. 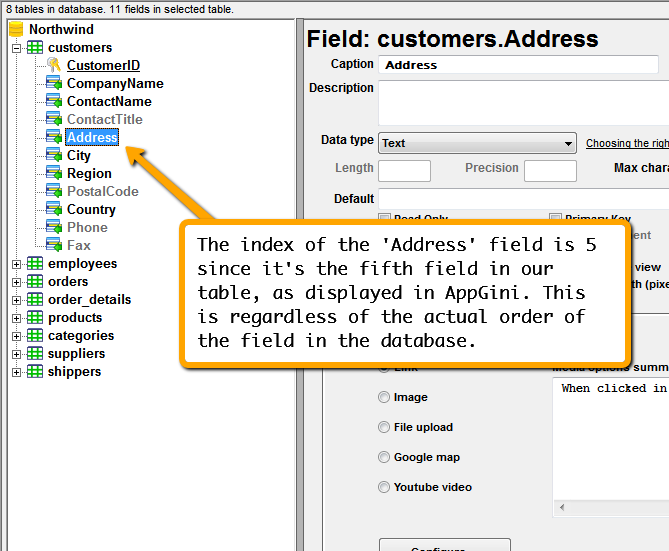 The above would add a full-text index on the ‘Address’ field of the ‘customers’ table. Full-text indexes can be used only with MyISAM tables. (In MySQL 5.6 and up, they can also be used with InnoDB tables.) Full-text indexes can be created only for CHAR, VARCHAR, or TEXT columns. If you’re using MariaDB, check full-text compatibility here. $options->QueryWhere .= ($op == 'not-like' ? 'NOT ' : '') . The above defines 2 functions: use_full_text_search() and reapply_pre_full_text_filter(). The first function should be called inside the init hook for our table, and what it does is prevent our AppGini application from performing normal search with LIKE operator on our full-text field. This is done by removing any defined LIKE searches on that field. The second function should be called inside the footer hook. Its purpose is to restore the removed LIKE search so that it’s still visible and configurable in the filters page. So, basically, we’re removing the filter before our AppGini app constructs the SQL query, and then adding it back after the query has been executed. This is how to retrieve the index of a field from the AppGini project. That’s all we need to do. Now, whenever any user defines a LIKE or NOT LIKE filter on the ‘Address’ field, our code would automatically change that to a full-text search on the field, dramatically reducing the query time. The above code won’t work unless the field has a full-text index applied to it. If all the data in the concerned field has a length of less than 756 bytes (which translates roughly to 255 characters if using Unicode encoding), it’s much simpler to apply a normal index and avoid all the above procedure. The above method works best with longer fields. The above code probably works fine if you define only one filter. It might not work when defining multiple filters, but I haven’t investigated this. Might revisit this post later and fix that, or if you have suggestions, please feel free to post your comment below.